1. TAL AJAJA (AFP).- When the Islamic State group captured Tal Ajaja, one of Syria's most important Assyrian-era sites, they discovered previously unknown millennia-old statues and cuneiform tablets, and then they destroyed them. The extremist group, which has ravaged archeological sites under its control in Syria and Iraq, was chased from Tal Ajaja in northeastern Hasakeh province in February by Kurdish fighters. But the destruction IS wrought there over two years remains. Perched on a large hill around 50 kilometres (30 miles) from the Iraqi border, the site is now a vision of desolation, riven with long tunnels. Fragments of broken artifacts are strewn throughout and large holes dug by looters pockmark the ground. The Assyrian empire, with its capital in Nineveh in modern-day Iraq, flourished in the first millennium BC. It produced celebrated artifacts, particularly bas-reliefs often depicting scenes of war. "Tal Ajaja, or ancient Shadikanni, was one of the main cities of Assyria," said Cheikhmous Ali of the Association for the Protection of Syrian Archeology. Most of the known treasures of Tal Ajaja, discovered in the 19th century, had long been removed and placed in museums in Syria or abroad. But the jihadists, as well as local looters, dug up artifacts that archeologists had not yet uncovered, destroying or trafficking priceless pieces. "They found items that were still buried, statues, columns. We've lost many things," lamented Maamoun Abdulkarim, head of Syria's antiquities department. 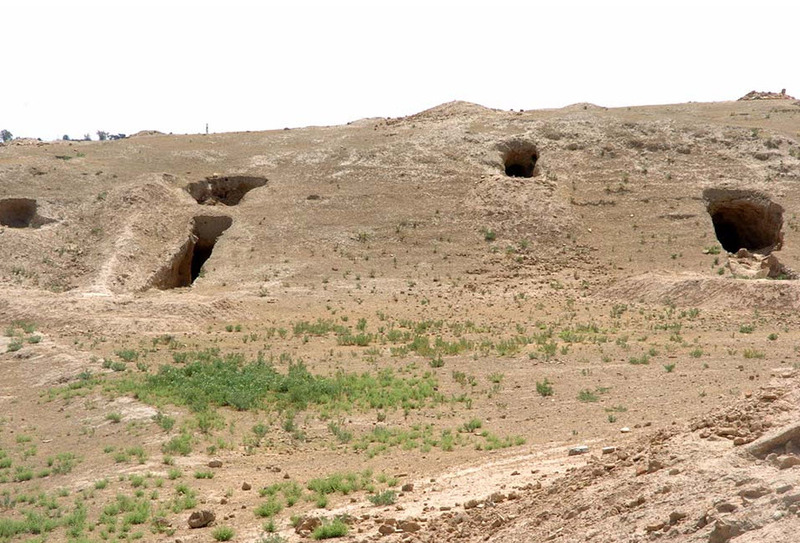 'Barbarians' More than 40 percent of Tal Ajaja was destroyed or ravaged by IS," added Khaled Ahmo, director of the antiquities department in Hasakeh. "The tunnels that were dug destroyed invaluable archeological strata" that would have revealed the economic, social and political history of the era, he told AFP. In IS's extreme interpretation of Islam, statues, idols and shrines amount to recognising objects of worship other than God and must be destroyed. But the group is also believed to have benefited from the trafficking of antiquities seized from sites under its control.In 2014, photos emerged of sledgehammer-wielding jihadists destroying Assyrian statues from Tal Ajaja dating back to 2,000-1,000 BC. "These barbarians have burnt pages of Mesopotamia's history," said Abdulkarim. "In two or three months, they wiped out what would have required 50 years of archeological excavations," he added.In 2014, the antiquities department on its website published a series of photos of items from Tal Ajaja that had been destroyed, including cuneiform tablets and bas-relief depictions of the lamassu -- the famous winged Assyrian deity. The lamassu is a creature from Mesopotamian mythology, often depicted with a human head, the body of a lion or bull, and the wings of an eagle.Though traditionally considered protectors and placed outside temples to guard them, the lamassu of Tal Ajaja were unable to escape IS's ravages. 'Cultural cleansing' "IS turned the hilltop into a military zone," said local resident Khaled, who spoke on condition a pseudonym be used because he still fears IS might return. "No one was allowed to enter the site without authorisation," he added. "Hordes of armed men came in, along with traffickers of archeological objects," added another resident, Abu Ibrahim.Tal Ajaja was also known by the name Tal Araban in the Islamic era. But "even the upper strata dating back to that era were razed," said Ahmo.Abdulkarim said numerous artifacts from the site were smuggled to neighbouring Turkey and on to Europe, adding that he had alerted Interpol in a bid to retrieve some of the items. Since its rise in 2014, IS has ravaged numerous archaeological sites in Iraq, including the ancient Assyrian city of Nimrud, provoking outrage. The UN cultural organisation has described the jihadists' actions as "cultural cleansing". In Syria, more than 900 monuments and archeological sites have been affected, damaged or destroyed by the regime, rebels or jihadists since the conflict began in March 2011, according to the Association for the Protection of Syrian Archeology.Among the worst incidents was the destruction by IS of temples in the famed ancient city of Palmyra, which provoked international outrage. Between 2014 and 2015, Syria's antiquities department moved some 300,000 objects and thousands of manuscripts from across Syria into storage in Damascus. But Abdulkarim has watched in horror as sites are laid waste by war and looters.